A stock that rises 20% to 25% from its correct buy point presents a choice. Do you hold or take the lovely gain in your growth stocks? Several factors can legitimately influence that decision. One: If the stock’s 20% gain comes in the first two or three weeks after the breakout, then the stock should be held at least eight weeks — barring outright sell signals or a severely negative change in the market trend. The great stocks often get a fast start. You don’t want to sell such a stock too early. Two: If the stock took longer to reach the 20% mark but has three quarters of EPS growth acceleration in a row, you might want to hold the stock. Three: If the 20% gain came slowly and from a second-stage base or later, you should sell. Most stocks correct after a 20% to 25% gain. A third-stage base is prone to fail. So, why hold for that? Four: If the gain came in an erratic fashion, sell. It doesn’t matter if the stock or the general market is to blame. Such a stock is likely to move against you quickly. Five: If you’ve taken a 7% or 8% loss recently, then the bias tilts toward taking the profit in the 20% to 25% gainer. It’s prudent to keep a 3-1 ratio between gains and losses. You can be right just once every four tries and still break even or make a small gain. Six: If you’ve taken several 7% to 8% losses and have no stock up 20% to 25%, consider taking smaller profits to erase the losses. Then you should step back and study your buys and sells to determine the reason you are losing. If the market is the problem, you need to raise cash and stay out of the market. If you’re the problem, you need to adjust your approach to avoid losing more money. If several stocks you sold put a 10% dent in your portfolio, that’s OK if winners have boosted your portfolio 30%. You must, however, take the profits at some point. Paper gains are imaginary until a sell makes them come true. 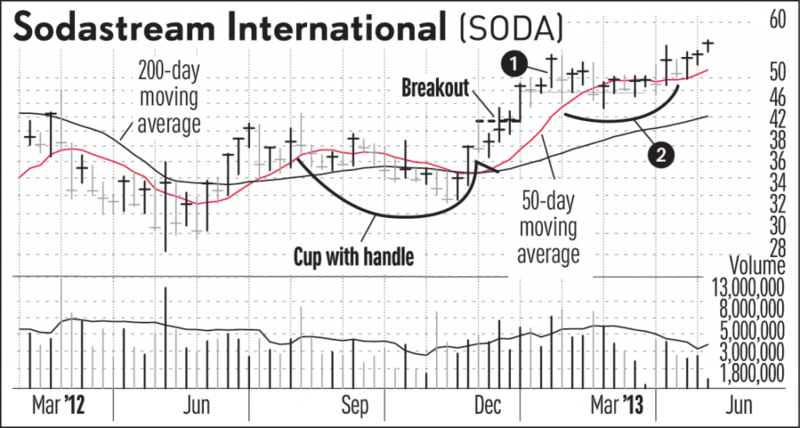 SodaStream International, which formerly traded under the ticker symbol “SODA” before getting acquired by Pepsico (PEP) in December 2018, cleared a 43.10 proper buy point in the handle of a long bottoming-style cup base on Dec. 17, 2012. Volume was heavy. On the day of the breakout, the maker of beverage-carbonation home appliances was No. 28 in the IBD 50. After clearing the base, the stock took about five weeks to reach the 20% profit level (1). Daily trading ranges were wide — not ideal. Given the loose action, taking the profit would’ve made sense. After hitting the 25% profit level on Jan. 25, 2013, the stock began work on a new consolidation (2). A version of this column was originally published on May 9, 2013. Please follow Whitfield on Twitter at @IBD_PWhitfield for more on stocks and financial markets. What Is The M in CAN SLIM? The post Sell And Take The Profit In Growth Stocks, Or Hold? Several Guidelines To Follow appeared first on Investor's Business Daily.